With the new season FINALLY starting in less than two weeks, I get it that there are lots of spoilers flying around right now. And according to some "OMG squeeeee" posts I figure they are good?! But PLEASE, I don't wanna know :D Call me old-fashioned, but I don't wanna know every deatail before I watch the episodes. The only thing I treat myself with are trailers, episode titles and promo pics. But yes, that's it. 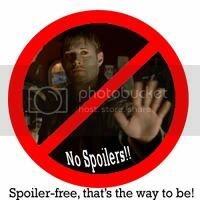 As I got almost spoiled today, just a quick plea to everyone on my flist: Please use cuts when you're talking about spoilers! :) Thank you!! I just dont get it! Last year around this time we already had lots of pics... but this year? None. It's very unusual that episode stills are out before the official pics! Yeah, so far the no spoiler thing is working great!! And I'm with you about the PB and Heroes spoilers! There are just very few shows I don't care if I get spoiled. Have you seen the Heroes premiere? Woahh...!! lol, using a Buffy quote? Go you! I'd totally use some myself if I weren't so senile, lol. :P Hmm, good point, we probably wouldn't have gone to Breakout. But, just think about all the cons we could have gone to - they have it pretty good over there. Though if I could choose, I think I'd go with being English - the number of cons they have over there is insane! *dreams about all the Buffy/Angel/Firefly/Supernatural/Heroes etc. cons she could go to* Lucky bastards, lol.